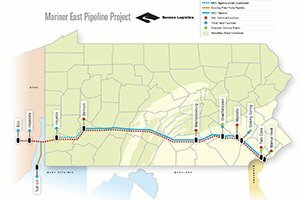 A map of the proposed Mariner East Project pipeline. Amid an ongoing criminal investigation of the Mariner East pipeline construction, Chester County District Attorney Tom Hogan rebuked a pipeline worker for his obscene Instagram messages directed a concerned resident. The county launched a broad investigation last month into Sunoco Pipeline's large-scale projects to complete the contentious Mariner 1, 2 and 2X pipelines, which are set to transfer fuel extracted from the Marcellus shale via fracking in western Pennsylvania to Delaware County's Marcus Hook Refinery. Officials are looking into past and future construction of the pipelines, which have been the source of intense battles with residents and the cause of several destructive incidents, opponents allege. In a notice on Wednesday, Hogan called attention to a December exchange between a pipeline worker and a Chester County resident on Instagram. 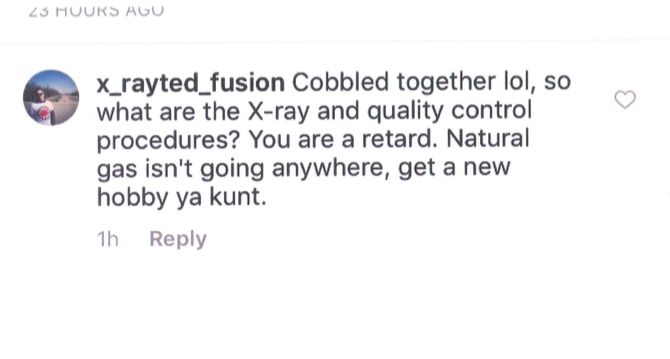 The resident, who was not identified, posted several messages about the pipelines and received responses from a pipeline worker using the handle "x_rated_fusion." Screenshots of the dialogue can be seen below (Note: These messages contain offensive language). Screenshot of Instagram comment from Mariner East pipeline worker. 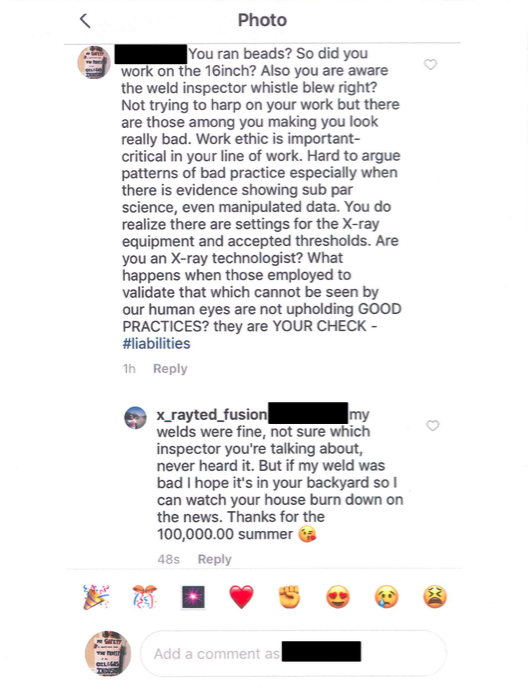 Screenshot of Instagram exchange between Chester County resident and Mariner East pipeline worker. "This sort of language and behavior is inappropriate and unprofessional," Hogan said in a statement. "Calling a woman that particular word is incredibly offensive, even if you spell it incorrectly. We will not allow our citizens to be bullied." Hogan added that he brought the exchange to the attention of Sunoco and the pipeline worker's union leaders in Texas and Oklahoma. Chester County residents have been hard-hit by the controversial project, including reports of sinkholes on private properties in East Whiteland Township and possible contamination of well water for residents in other parts of the county. A fiery gas line explosion in Beaver County last fall also gave prosecutors evidence of "tangible danger and destruction" caused by the pipeline construction, Hogan said last month. Potential charges stemming from the investigation could include causing or risking a catastrophe, criminal mischief, environmental crimes and corrupt organizations. Dallas-based Energy Transfer LP, the parent company of Sunoco Pipeline, has denied the allegations brought forward by Chester County prosecutors. "We are confident that we have not acted to violate any criminal laws in the Commonwealth of Pennsylvania and we are committed to aggressively defending ourselves against these baseless allegations," spokeswoman Lisa Dillinger said last month. Hogan has been critical of Pennsylvania Gov. Tom Wolf and his administration's oversight of the Mariner East construction. The Pennsylvania DEP has issued more than 80 Notices of Violation to Sunoco Pipeline and collected more than $13 million in penalties for environmental damage, but Hogan believes the state has not gone far enough. "We understand that only the Pennsylvania Utility Commission or the governor can shut down construction of these pipelines, and neither has shown any inclination to do so," Hogan said. "But we can at least make sure that anything that happens in Chester County complies with the criminal laws of Pennsylvania."